While we're sure you're already aware of how unpredictable and ever-changing each individual pregnancy can be, it always comes as a great help to prepare for the birth as much as possible. By creating a birth plan with your midwife or chosen health professional, you will be able to map out the details of your birth experience as you would like it to develop, while also preparing for any eventualities beyond your control. What is a Birth Plan? Although a birth plan is not an essential requirement for expectant mothers, it certainly acts as a useful reference for the midwives and doctors who will be looking after you, while also providing a great way to prepare for your labour in advance of your due date. While certain aspects will be affected by factors such as previous pregnancies and other medical history, the main aim of the birth plan is to give you as much control over the details of your labour as possible. From where you would like to give birth to your choice of pain relief, your plan should contain all of your preferences for the birth of your child, based on your own inclinations combined with the advice of your midwife. While it is vitally important that the plan should reflect your individual wishes, you should also remember the importance of flexibility, as you may need to adjust your plan to deal with unexpected circumstances once you have gone into labour. Your midwife will, of course, strive to follow the original plan as much as possible, but it is important to realize that not all your preferences will be achievable if circumstances change. Before setting out a birth plan, you should seek out advice from medical professionals and other mothers in order to get a better idea of the pattern you would like your birth to follow. This will go hand-in-hand with your hospital appointments throughout your pregnancy, as well as your participation in local antenatal classes, which should give you countless opportunities to seek advice and assess your options. As you gather your information, you can note it down for reference when you come to setting out your finalised plans. Once you have gathered sufficient information regarding the services available to you (along with identifying any possible constraints), you should then discuss these with your chosen birth partner. This will give them a chance to add any of their own suggestions, while also allowing them to gain a better understanding of how they can support your throughout the birth. Identifying Your Birth Partner - Name your partner and explain their level of involvement in your birth, making a note of any procedures you do not want them to be present for. Pain Relief - Specify the type(s) of pain relief you would like to receive in order of preference, drawing attention to any you would like to avoid if possible. This should include medical treatments as well as natural forms of pain relief. Position - Explain your preferred position for delivery, while also noting how flexible you would like to be in terms of your mobility during labour. Location - This will include the geographical location you have selected for your birth, as well as your preferred delivery room style. This could, for example, include a request for a home birth. Interventions - Include details of any interventions you would be happy to accept if the situation calls for them. This includes details such as speeding up your labour or assisted birth. Heart Rate Monitoring - Provide details of how you would like your baby's heartbeat to be monitored during labour. Third Stage Planning - This includes details for the delivery of the placenta and the cutting of the umbilical chord. Post-Birth Details - Specify whether you would like your baby to be handed to you straight away or after cleaning, and explain your plans for feeding. Emergency Care - As well as planning for any unexpected changes to the birth itself, you can also note your wishes in the event that your baby has to receive any additional care. What if I'm Having a Caesarean? If you've been advised to book a planned caesarean due to a medical condition or previous pregnancy, you will still be able to have a degree of control over your birth. You will still be able to choose the type of pain relief you would like to receive, although this will relate to the choice of anaesthetic and how it is administered. You will also be able to include your birthing partner in your plans, although they will have to follow the guidelines set out by the hospital. As well as selecting the medical details for your caesarian, you will also be able to decide on the ambience of the room, along with how much of the birth you would like to witness. This could include the amount of sound in the room, as well as your choice of if and when you would like the screen to be lowered during the birth. When putting your birth plan together, ensure that the opinion of your trusted medical professional is valued above all else. For assistance in creating your plan, ask your doctor or midwife for help, and use the information you have gathered during the course of your pregnancy. Here at First Encounters, we offer a complimentary pregnancy report with all of our scans, which can provide you with essential details about the health and position of your baby, in order to help you plan more efficiently for the birth. If you would like an additional glimpse at your little one before the birth, or would like to gain more information to help you plan for their arrival, take a look at our range of scan packages here. When Do Babies Start Kicking? Feeling your baby kick for the first time is an important milestone for any expectant mother, particularly when it's your first pregnancy. It can be extremely exciting to have that spark of life inside of you confirmed, although it can also be somewhat difficult to understand what kind of sensation to expect, and when! We've come to realise that many women are unsure about monitoring their baby's movements, and so we thought that we would write an informative piece for reference. In this blog post, we'll outline the types of sensation that you can expect to experience at various points throughout your pregnancy. What will the movement feel like? The first movements of your pregnancy, referred to as 'quickening', are usually described as a fluttering sensation. If this is your first pregnancy, you may find it somewhat difficult to identify, but should find it more and more easy to pinpoint as time passes. By the second and third trimesters, your baby's movements should be far more distinctive, as you will be able to prominently feel your baby's kicks and jabs. When will I start to feel these movements? The time frame for experiencing your baby's movements can vary quite substantially in the early stages, particularly when comparing first pregnancies with those of women who have experienced pregnancy before. The average time to expect a detection of movement, however, is between 18 and 20 weeks. As previously mentioned, this may take slightly longer if it's your first pregnancy, and may even come as early as 16 weeks if you've already had a baby. If you haven't experienced any movement by 24 weeks, you should consult your midwife so that she can check that all is well. How often should my baby be moving? Again, there are no set amount of movements that you should look out for, although you may find that your baby is most active between 9 PM and 1 AM. There is also evidence to show that by your third trimester, your baby will move around about 30 times each hour, although you may not discern all of these. There is no need to keep a chart of how many kicks you feel each day, although it is useful to familiarize yourself with your baby's movement patterns during waking hours. This will be different for everyone, so it's all about taking note of the movements and getting to know what's normal for your baby.The best way to identify these kicks and wriggles is when you're lying down, so try to put your feet up for a while so that you can really take notice of what you're feeling. If your baby's movement pattern changes suddenly and your are concerned, again, as your doctor or midwife to take a closer look. Will I see my baby moving when I have an ultrasound scan? If your baby is awake during your scan, then of course, you will be able to see your baby move! At First Encounters, we recommend receiving your scan between 25 and 29 weeks, as your baby will be well-developed by this time, and will also have plenty of room to move around. If your baby has assumed and awkward position and we are unable to obtain a high-quality image, your sonographer may ask you to stroll around in order to encourage movement. If your baby is being particularly difficult on that specific day, we will offer you a complimentary re-scan on an alternative date. With selected scan packages such as the Deluxe 4D, you will receive a 5 minute DVD recording, which will allow you to relieve your unborn baby's movements for years to come. You can preview our 4D scan images and video recording in our gallery, to give you a better idea of just how detailed our recordings are. If you would like to witness your own babies movements in stunning 4D imagery, book one of our scan packages today, or get in touch to find out more about our services. Further details about our scans and what they are able to reveal, can be found on our FAQs page. We recently received a lovely review from an expectant mother who visited our Bristol ultrasound clinic for a 4D scan a few weeks ago. Having received a disappointing 4D scan from another provider in the past, this particular lady was at first a little apprehensive about coming to the First Encounters clinic; family issues and a difficult pregnancy added to her pre-scan stress, meaning that our staff had to take extra care to deliver a pleasant and memorable experience. As usual, though, we were more than up to the challenge, and the customer’s glowing review is testament to the great customer service we provide here at First Encounters Bristol. In her testimonial, the soon-to-be mum praises our clinic staff (“the staff made me feel very relaxed”) and states that she will happily recommend First Encounters to any friends thinking of booking their own 3D/4D scan. All of us at First Encounters Bristol would like to extend a huge thank-you to this customer for sending us this review. It’s always immensely satisfying to hear that people are impressed with our services, as we do our very best to deliver top-quality results in a relaxed and stress-free atmosphere. Browse our scan package options to see what kind of baby bonding experiences we can offer you, or click here to see more details about our clinic in Bristol. 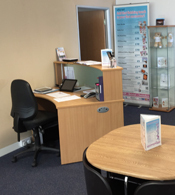 Have you visited our Bristol clinic? Review us on Google! 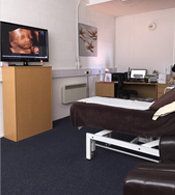 If you’re looking for the ultimate ultrasound experience in Bristol and the South West, then look no further than our state-of-the-art baby scan clinic in Portishead. Thanks to its convenient location just 2 miles away from the M5, it’s easily accessible from a number of different areas, providing customers with easy access to our wonderful range of services. From early pregnancy scans to gender scans and 4D scans, we offer a fantastic selection of private ultrasound packages at our Bristol clinic with options to suit every requirement and budget. To ensure that each of our customers has a pleasant and memorable experience, our scan rooms are softly lit and comfortably furnished, for a cosy, relaxing atmosphere. For those who would like to share this special experience with their loved ones, we also provide seating for up to six guests, allowing you to enjoy their companionship without the room feeling cramped or crowded. As well as providing a friendly and relaxing service, the staff at our Bristol ultrasound clinic also do their very best to provide you with a high-quality image of your baby, using the most advanced ultrasound imaging machine available, for unequalled levels of clarity. They also have years of experience in the industry and are highly qualified, which means that they will be able to answer any questions that you may have while providing you with expert guidance. "Heard how good it was through a friend, fab to be on a bank holiday so family and partner can come and not have to take time off work, thank you"
"The packages displayed online were very clear and played a huge part in choosing First Encounters, it was brilliant, thanks again"
"Recommended by a friend, excellent, kind, friendly and professional"
3D/4D Scans: Introduce Your Child to Their New Sibling! While we often place a great deal of emphasis on the unique and moving experience our scans provide for expectant parents, our ultrasound packages are designed to offer a unique insight into your baby’s world for all the family, including children. If you’ve already started a family, you’ll no doubt want your child to be able to experience the excitement of your pregnancy, allowing them to form a close bond with their little brother or sister before they arrive! Luckily, our ultrasound scans give you the perfect opportunity to share this beautiful bonding memory with your child, either during or following the scan. Give your child a detailed glimpse of their unborn sibling. Your child will naturally be rather curious about their new sibling, and a 3D/4D scan gives them an incredible opportunity to see their future brother or sister for the first time, in strikingly clear imagery. If you would prefer not to have your child with you when the scan itself takes place, we offer a variety of souvenirs that will allow you to share this important memory with them in the comfort of your own home. Enjoy our comfortable, spacious surroundings. Our scan rooms are able to accommodate up to six guests, which means that there will be more than enough room for you and your child(ren) during the procedure. The spacious size and relaxing atmosphere of our clinics are ideal for small children, who may find themselves becoming bored or impatient in a small, stuffy space. Take home our child-friendly gifts. As well as having a detailed image of your little one to share with your child, you will also have the opportunity to present them with one of our adorable scan gifts! For £20 you can record your baby’s heartbeat onto one of our cute and cuddly Heartbeat Bears, providing a sentimental keepsake and a treasured companion for your child. Find out whether it’s a brother or a sister! Many of our scan packages offer you the opportunity to discover your unborn baby’s gender, which means that your child will also be able to find out whether they are having a little brother or sister. Again, this will give them a unique glimpse into the baby’s world, and will allow them to share in your excitement as you discover the happy news. Click here to view our scan packages and book your ultrasound experience online!